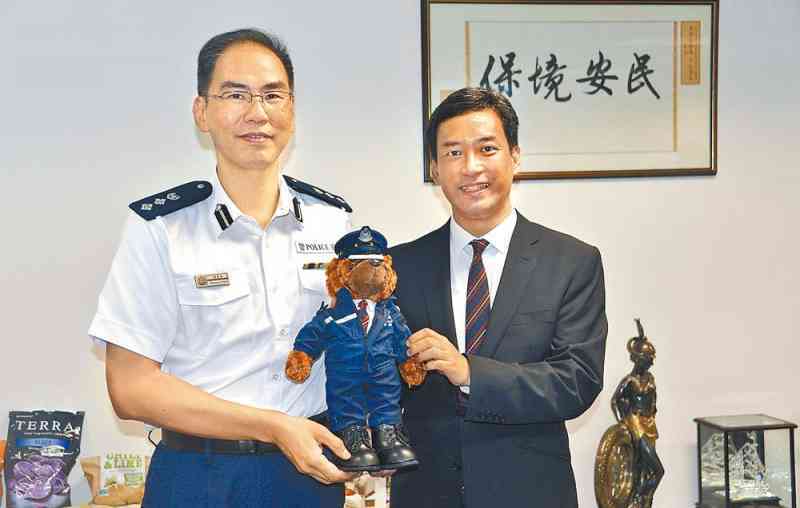 About 30 officers from different formations and units, who are old boys of the Diocesan Boys' School (DBS), gathered at Central Police Station on October 23. There was no official agenda for the gathering, except meeting a VIP, Mr Ronnie Cheng, Headmaster of their old school. The meeting started with a speech given by the most senior old boy, Central District Commander, Chief Superintendent (CSP) Benson Chau, followed by words of cheer by Mr Cheng. He shared with the old boys the Prayer of St. Francis of Assisi with a view to cheering up the alumni, and distributed the DBS school badges as souvenir. All old boys were thankful for their Headmaster's support for and recognition of their hard work. As the occasion was closed to his forthcoming retirement, CSP Chau was presented with a souvenir, and so was Mr Cheng for his attendance at the gathering.